For other uses, see Pudding (disambiguation). The modern usage of the word pudding to denote primarily desserts has evolved over time from the originally almost exclusive use of the term to describe savory dishes, specifically those created using a process similar to that used for sausages, in which meat and other ingredients in mostly liquid form are encased and then steamed or boiled to set the contents. 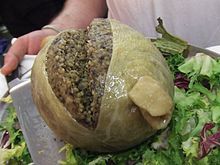 Black pudding, Yorkshire pudding, and haggis survive from this tradition. In the United Kingdom and some of the Commonwealth countries, the word pudding can be used to describe both sweet and savory dishes. Unless qualified, however, the term in everyday usage typically denotes a dessert; in the United Kingdom, pudding is used as a synonym for a dessert course. Dessert puddings are rich, fairly homogeneous starch- or dairy-based desserts such as rice pudding, steamed cake mixtures such as treacle sponge pudding with or without the addition of ingredients such as dried fruits as in a Christmas pudding. Savory dishes include Yorkshire pudding, black pudding, suet pudding and steak and kidney pudding. 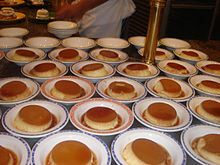 In the United States and some parts of Canada, pudding characteristically denotes a sweet milk-based dessert similar in consistency to egg-based custards, instant custards or a mousse, often commercially set using cornstarch, gelatin or similar collagen agent such as the Jell‑O brand line of products. In Commonwealth countries these puddings are known as custards (or curds) if they are egg-thickened, blancmange if starch-thickened, and jelly if gelatin based. Pudding may also refer to other dishes such as bread pudding and rice pudding, although typically these names derive from their origin as British dishes. In the United Kingdom and some of the Commonwealth countries, the word pudding can be used to describe both sweet and savory dishes. Unless qualified, however, the term in everyday usage typically denotes a dessert; in the United Kingdom, pudding is used as a synonym for a dessert course. The modern usage of the word pudding to denote primarily desserts has evolved over time from the almost exclusive use of the term to describe savory dishes, specifically those created using a process similar to sausages where meat and other ingredients in a mostly liquid form are encased and then steamed or boiled to set the contents. The most famous examples still surviving are black pudding, which was a favorite of King Henry VIII, Yorkshire pudding, and haggis. Other savory dishes include suet pudding and steak and kidney pudding. Boiled or steamed pudding was a common main course aboard ships in the Royal Navy during the 18th and 19th centuries; pudding was used as the primary dish in which daily rations of flour and suet were employed. Pudding of the dessert type may be served with toppings such as fresh fruit and whipped cream. Commonwealth dessert puddings are rich, fairly homogeneous starch- or dairy-based desserts such as rice pudding or steamed cake mixtures such as treacle sponge pudding (with or without the addition of ingredients such as dried fruits as in a Christmas pudding). In the United States and some parts of Canada, pudding characteristically denotes a sweet milk-based dessert similar in consistency to egg-based custards, instant custards or a mousse, often commercially set using cornstarch, gelatin or similar collagen agent such as the Jell‑O brand line of products. In Commonwealth countries these foods are known as custards (or curds) if they are egg-thickened, blancmange if starch-thickened, and jelly if gelatin based. Pudding may also refer to other dishes such as bread pudding and rice pudding in North America, although typically these names derive from their origin as British dishes. The original pudding was formed by mixing various ingredients with a grain product or other binder such as butter, flour, cereal, eggs, and/or suet, resulting in a solid mass. These puddings are baked, steamed, or boiled. Depending on its ingredients, such a pudding may be served as a part of the main course or as a dessert. Steamed pies consisting of a filling completely enclosed by suet pastry are also known as puddings. These may be sweet or savory and include such dishes as steak and kidney pudding. The second and newer type of pudding consists of sugar, milk, and a thickening agent such as cornstarch, gelatin, eggs, rice or tapioca to create a sweet, creamy dessert. These puddings are made either by simmering on top of the stove in a saucepan or double boiler or by baking in an oven, often in a bain-marie. These puddings are easily scorched on the fire, which is why a double boiler is often used; microwave ovens are also now often used to avoid this problem and to reduce stirring. Creamy puddings are typically served chilled, but a few, such as zabaglione and rice pudding, may be served warm. Instant puddings do not require boiling and can therefore be prepared more quickly. This pudding terminology is common in North America and some European countries such as the Netherlands, whilst in Britain egg-thickened puddings are considered custards and starch-thickened puddings called blancmange. Table cream is a dessert, similar to blancmange. The dessert was popularized by English manufacturer Symington's Ltd in the early 20th century. It is still produced under the Symington's brand name, but no longer made by the original company. The proverb, "The proof of the pudding is in the eating", dates back to at least the 14th century. The phrase is widely attributed to the Spanish author Cervantes in his novel The Ingenious Gentleman Don Quixote. The phrase is often incorrectly stated as "the proof is in the pudding." Pink Floyd's "Another Brick In The Wall, Part 2" ends with the voice of a Scottish-accented schoolmaster shouting, "If you don't eat your meat, you can't have any pudding! How can you have any pudding if you don't eat your meat?!" over and over again. Pudd'nhead Wilson, written by Mark Twain, reflects the term's use as a metaphor for someone with the mind of a fool. A website dedicated to the dessert, online since the mid-1990s and consisting only of a low quality image of it, became famous in Brazil for its humorous and longstanding nature. In 2015, it was hacked by the Islamic State. 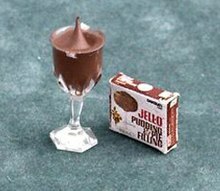 ^ The word pudding is believed to come from the French boudin, originally from the Latin botellus, meaning "small sausage", referring to encased meats used in medieval European puddings. ^ Olver, Lynne (2000). "The Food Timeline: pudding". Retrieved 2007-05-03. ^ "Frequently Asked Questions". symingtons.com. ^ "Origin Phrase "Proof is in the Pudding"". phrases.org.uk. ^ "Famoso site pudim.com.br é invadido e mostra imagem e música do Estado Islâmico" [Islamic State hacks the famous website pudim.com.br]. Extra (Globo) (in Portuguese). 9 April 2015. ^ "Site Pudim.com.br é hackeado pelo Estado Islâmico" [The Pudim.com.br website is hacked by the Islamic State] (in Portuguese). R7 (Record). 9 April 2015. Na ativa desde 2000, site é um dos mais famosos da internet brasileira [Active since 2000, the website is one of the most famous in the internet in Brazil]"
Wikimedia Commons has media related to Puddings. Chisholm, Hugh, ed. (1911). "Pudding" . Encyclopædia Britannica (11th ed.). Cambridge University Press.